Are you in despair about what you read and hear on the news today? Do you wonder what you can do to help the world heal? Do you believe that we are in apocalyptic times or that we are approaching the ‘war of all against all’? Do you wonder why a loving creator could take us this far on our journey as humans to have us come to such a cataclysmic ending? But what if the purpose of the human journey is to awaken higher consciousness in each one of us? 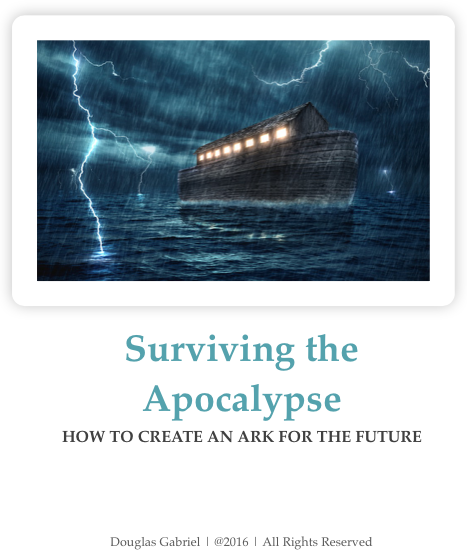 What if apocalyptic stories, which have always been in our cultural myths and religious stories since the beginning of time, serve a greater purpose in creating unending personal fear and terror to the point that we feel hopeless and helpless, full of despair, and incapable of fully understanding or solving the overwhelming problems in the world? Then, after exhausting all efforts to stay abreast of the latest shocking headline, we finally choose another way to see and be in the world. We turn towards prayer and spiritual comfort. We look for answers that exist beyond the machinations that lead us here in the first place. Perhaps there is a greater purpose for apocalyptic stories since they have always been with us. Perhaps the way out is walking through the very fear and terror that end-of-days stories create in us. For the time that it takes you to read this essay, the reader is asked to suspend all fear and doubt of any impending disasters that will affect him or her personally or the world as a whole. Imagine that our apocalyptic expectations act more as a mirror to our anxieties, whether personal or collective, than as actual signposts to imminent disaster and death. See fear as F.E.A.R—false evidence appearing as reality—and hold a thought that maybe the intensity of apocalyptic stories and headlines today are directly related to the state of consciousness that each of us has about crossing the threshold. And that if, one by one, we start awakening to our own higher consciousness, then collectively we can find hope for any end-time scenario. Here is a great truth that all initiates eventually come to know when they are fully awake in spirit. Everything you see before you, in the world and in your personal life, is all for a purpose; and that purpose is to awaken you to yourself as a spiritual being (Spirit Self), the everlasting part of you that is one with the divine. Once you pass across the threshold of fear and doubt, by studying, living, and embracing a spiritual life exemplified by the Heavenly Virtues, you will be liberated from the terror and fear of apocalypse. We all know of the apocalyptic stories of Noah and the flood and St. John’s Revelations. These stories, which have been with us for thousands of years, depict how one civilization ended and how another might begin. Apocalyptic stories have a long history. Five centuries span the images of the four horsemen, from the woodcut of the Four Horsemen by Albrecht Durer (German, 1498) to Jason de Caires Taylor’s contemporary sculptures of the four horsemen immersed in tides of the river Thames (The Rising Tide, 2015), with countless paintings, sculptures, poetry, and prose all along the way, warning each new generation of the coming of the end. A mix of doom and redemption is at least more hopeful than the standard dystopia that most futuristic movies depict as a starting point – total apocalypse and destruction being a given. There is a sense that the future fate of humanity hangs in the balance and a decision confronts the modern thinker that tends to make one an extreme optimist certain of a New (Golden) Age, or an extreme pessimist wondering whether humanity will continue at all. Spiritually oriented people tend to see the future as positive, but can also be disappointed by the daily ‘war of all against all’ that appears in the world. Materialists expect the ‘end of days’ any moment and may spend much time and effort in disaster, end-times preparation; they want to ensure that the cataclysmic days ahead will not cause them or their families loss of modern comforts. Those in the middle are adrift in apathetic bliss brought on by comfortable ignorance. Others may be preparing for a type of ascension where alien spacecraft will take them to a place beyond the world’s chaos. Perhaps your end-time scenario has more to do about who you are in relationship to your spiritual consciousness than what might actually happen. After all, if you are reading this article, the end-time scenario for you hasn’t happened yet and what you think will happen is still pure speculation, just a mirror of your own state-of-mind or manifestation of your consciousness soul. When there is an ‘end time’, like the flood myth, there is always a way through it for those who are listening carefully and obeying a higher power. In this case, God tells Noah to build an ark and to others ‘flee into the mountains.’ There is always a way out for the righteous, even if it entails forty days in an ark or living in mountain caves for years. In the end, the pruned stock of humanity carry on and multiply, whether through Noah, Abraham, Lot, or any of the anti-deluvian heroes. Those found to be righteous continue on and develop a new world. Young gods in Norse and Greek myths overthrow the older gods, a tradition that continues until the gods themselves are overthrown by humans. In each transitional phase, only a few chosen ones are spoken to by a higher power and told what to do to survive and carry over the old wisdom into a new age. In Norse mythology, a new rainbow bridge was created for the younger gods to cross over into the higher realms after the older gods died in the battle of Ragnarok. In modern versions of this transition, the mothership shows up and takes 144,000 of the elect to a new and better planet. There is not much of a difference between the old and the new versions that refer to New Jerusalem descending from the sky to be the new home of the chosen 144,000 who come through the twelve gates. Whether we use images from sacred books or the plots of modern movies, we come up with similar descriptions of what the future may hold. Religions may teach that we could be “translated” into heaven by a “rapture” wherein the good people just disappear and are “caught up in the clouds” with their redeemer who has returned to get them. Or we could wait for a spectacular spaceship to open its doors and welcome us aboard. In both versions—religious or Hollywood, we are lead to believe that there isn’t much we can do except wait for the event and then take our ride to heaven. Unfortunately, that is not quite how spiritual development works. It takes effort to rise up to the next level. Self-development is like climbing a mountain, a quest to find the refined aspects of thinking, feeling and willing that transform the soul into spirit, or the mundane into the eternal. 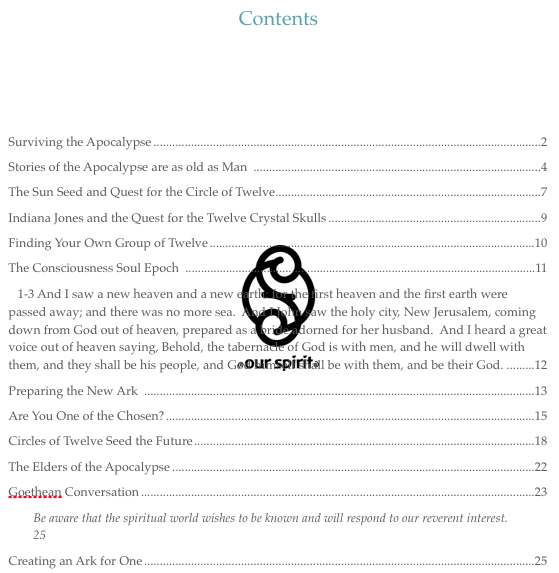 In actuality, those who will be “saved” from the earthly apocalypse will be those who work steadily at self-reflection that leads to spiritual development that reunites the individual with the twelve celestial forces that ray down into the currents of the human etheric body, a body of time that is aligned with the movement and rhythms of heavenly bodies. Those who study the works of Rudolf Steiner (1861-1925) and anthroposophy know that we are currently in the epoch of consciousness soul. The epoch just before it was the intellectual soul epoch (747 BC to 1415 AD) where the Greek and Roman cultures prevailed, and the one following the consciousness soul epoch, which is the one to which we are evolving, is called the Spirit Self epoch when the Russian people will lead human cultural development. In the epoch of the intellectual soul, humans developed thinking, logic, reasoning and the human mind. This epoch gave birth to early Roman and Greek cultures and lead to the advent of the Renaissance. During the consciousness soul epoch (1415 AD to 3575 AD), humanity evolves to discover the eternal truths in the world. In order for this to happen, the spiritual world is temporarily veiled from consciousness until the aspirant re-discovers, with waking consciousness, the spiritual behind the material world. According to Steiner, the epoch of consciousness soul fills the aspirant with despair, loss of hope, helplessness, and soul isolation. When we see the world through the lens of materialism, it looks like illness, sickness, lack and scarcity, old age, death, terror, fear, and apocalypse. It is during this epoch that we are supposed to fully awaken to our egohood, and hence our spiritual nature; in language frequently used on the internet today, we are supposed to WAKE UP during this epoch. We pierce the veil of maya and see that behind the material world is a teeming life of spirit. The epoch that follows is Spirit Self where the eternal truths of the consciousness soul epoch are transformed into higher thinking called Imagination. This is where the aspirant is released from the illusion of the material. For some, it will take all 2,160 years and several incarnations to wake up and evolve from the consciousness soul to Spirit Self because we have been given free will to decide when and how we will tread this path. For others, the transition will not be made. And for spiritual initiates who have already begun to re-discover spirit behind all events and phenomena, the evolution can come sooner. If you are feeling despair and anguish and see only chaos in the world around you, take comfort that you are right where you are supposed to be and can ascend to a higher consciousness by turning to a spiritual life. At any point you can choose to know a higher dimension, frequency, awareness, or resonance, and free yourself from the illusion of the material matrix. The quest for the circle of twelve (and the inspiration of the thirteenth) was at the heart of a story that I wrote many years ago entitled, Sun Seed. In it, a young man goes to South America to fulfill a hounding dream that draws him to hidden caves near Cuzco and Lima. After many adventures, he discovers the caves and realizes that his dreams were more than real. He finds the other parts of his being in the circle of twelve beings who he is familiar with from numerous incarnations they have spent together. This group was the earthly counterpart to the Mother Lodge of Humanity that is composed of twelve bodhisattvas surrounding Christ. A second group was in an underground cave called Agartha in the Himalayan Mountains. That group of twelve was the same group that were the apostles of Jesus Christ in Palestine. These two groups usually alternate their incarnations so that only one group of twelve is incarnated at one time and that group tries to mirror the Mother Lodge of Humanity who are often called the Masters of Wisdom and the Harmony of Feelings and Sensations. The Comte de St. Germaine is the leader of one group and Zarathustra (the Master Jesus) leads the other. These groups have been written about in the history of the Rosicrucians, and Rudolf Steiner goes into great detail outlining who each of the masters is and what their missions entail. Seven of them are the reincarnated Holy Rishis who traveled in the ship with Manu from Atlantis to the Central Asian Mystery Initiation Center. The other five are leading representatives of each of the five cultural epochs. When all of the circle of twelve unites, sacred magic is possible. Because our world is faced with overwhelming challenges that could bring on the ‘war of all against all’ much too early, the spiritual world has emptied itself of all souls, including great beings that have incarnated to help us through these critical times. This includes both groups of twelve that mirror the Mother Lodge. These twenty-four beings are referred to as the twenty-four elders before the throne and they are all here to help us. Never before have so many master beings been incarnated and available to help us on the physical plane. These master beings will have much to say about the directions humanity will take at this significant turning point in human spiritual history. In Sun Seed, the protagonist of the story is the last of the masters to join the circle, drawn there by the minds of the other eleven through spiritual gravitation. He discovers underground caverns filled with gold beyond imagination. He finds a round temple whose walls are lined with concave dishes of polished gold that continuously reflect the sunlight let into the chamber. Streams of water swirl around the sphere and through six different eddies around the outside. Flames burn brightly at twelve points along the sphere in a Zodiacal band. The air is filled with an ethereal substance that is cleansing and nourishing at the same time. Though there is no source of light, the entire sphere is lit up by glow that seems alive and interacts with the twelve flames. Once the young master finds his place amid the other twelve, he discovers in the midst of the circle an angel-like being who they call Unam, or Sophia. Her very presence is like a brilliant light filled with wisdom that nourishes parts of the soul and spirit that had been long forgotten or yet to awaken. She is the paragon of his aspirations, the substance of divine origin that illuminates the self through the selfless eyes of the others in the circle of twelve. Through her, the twelve are able to move through space and time together directed by consciousness and travel the spheres through the paths of life, death and rebirth. This story is a fairy tale that basically describes the parable of the prodigal son who returns to his home and is rewarded for his suffering. It is the story of Cinderella, Psyche, Heracles, Orpheus, and all of the souls on the quest for the Holy Grail of love. In the eighties, I shared the Sun Seed story with Kathleen Kennedy during a time we were discussing themes and story lines for the Indiana Jones movies. Unfortunately, the content of the Sun Seed-Holy Grail story that had been discussed with Steven Spielberg’s associate turned out to be only a few minutes of screen time in Indiana Jones and the Final Crusade. The deeper meaning of the Holy Grail was usurped by big screen action and thrills. Very little of the spiritual richness of the grail story found its way into the final cut except at the end where a simple fairy tale version of the Holy Grail was given. Likewise, Indiana Jones and the Kingdom of the Crystal Skull, was disappointingly lacking in spiritual content and fell back into the use of crystals as the central activating mechanism of transcendental experience. Using a fictitious story about eleven crystal skulls that had been recovered from different archeological sites, like the Mitchell-Hedges crystal skull, the screen play writers combined the story, Sun Seed, about an aspirant looking for the other eleven members of his Sun Ark, with the quest for the missing twelfth crystal skull. Instead of a Sun Ark, which is a circle of twelve initiates joined together to balance the forces of the sun and the planets against the upheavals on Earth created by large sunspots and solar flares, the Indiana Jones’ movie gave viewers an image of a UFO with twelve aliens (crystal skulls) which had been brought back to life. Although the original Sun Ark in Sun Seed becomes an other-worldly vehicle for moving through the solar system, it wasn’t imagined originally as it was depicted in Indiana Jones—a physical alien ship that arises from its underground hiding place and zooms off into the galactic sunset. In Indiana Jones and the Kingdom of the Crystal Skull, the missing skull is of an alien that once awakened, unites with the other eleven alien skulls. This part of the story is somewhat similar to Sun Seed in that the spiritual aspirant is on a quest to find others like himself and unites with them to become the new “Noah’s Ark” that helps save the planet. The Sun Ark is not a UFO or alien vessel, but an archetype of higher spiritual groups (lodges, chariots, temples, or circles) coming together to unite the forces of consciousness that can perceive and utilize the harmony of the spheres that emanate from the sun and planets as positive forces that transform the human into a higher order being. This “reuniting with the twelve” is an old tradition that goes back to the division of the heavens into twelve images, or imaginations of the forces emanating from the different areas of the sky. Just as Heracles accomplished his Twelve Labors and was given a permanent home in the stars, the task of bringing together twelve divergent energies into one synthesis is the modern Twelve Labors. Understanding and focusing the three soul forces of thinking, feeling and willing is difficult enough in self-development. Adding to them the forces and energies of the twelve directions is indeed a Herculean labor that matches the intensity of modern apocalyptic life. The Sun Ark is reminiscent of the twelve Egyptian hierophants (masters) standing around the ritual tomb of the candidate for initiation. The twelve hierophants each represented one of the Zodiacal twelve influences and they hold those influences in check while the candidate becomes acquainted with them as actual Beings. After three days of ritual, death-like sleep, the candidate is awakened and the memory of his experiences are imprinted into the etheric body of the candidate. The twelve Zodiacal influences then became available as a celestial map for the soul to find the spirit. The candidate learns to walk through the Zodiac as a Herculean hero walking through the starry sky.